Roll Out the Barrels! Harvest that Rainwater! So, like Frank said earlier, a lot of rain fell in a short time here today. And checking OB Joe’s math got me sidetracked (I’m supposed to be figuring my taxes) and I left a response to his comment and that set the wheels in my head spinning. Okay Joe, here’s my take on the whole acre foot deal….. The OB Planning Board says OB is 742 acres, if it rained 12″ (1 foot), that would be 742 acre feet (a volume measurement), so 1″ of rain is 1/12 of 742 acre feet, or 61.83 acre feet of water. Almost 62 acres would be covered by a foot of water. 62 acres is about the same amount of land that would be encompassed by starting at the corner of Newport and Abbott, walking up Newport, left on Cable, then left on Muir, left on Abbott and back to Newport. One acre-foot is about 326,000 gallons, so 62 acre feet is about 20,202,789 gallons! According to the San Diego County Water Authority, an acre-foot of water can supply the household needs of two four-person families for one year, so 62 acre feet could supply 124 families for a year. I wonder if that is before or during rationing….? Anyway, Frank and I had talked before about collecting rainwater and I had a vision of a couple of 55 gallon drums hooked up to some rain gutters. I was curious how much water we could have collected off the roof today (as I write this the heavens have opened up again) and I was actually shocked. Say your roof is 20 feet wide and 50 feet long, that’s 1000 square feet (an easy number to work with and slightly smaller than this house). If it was covered by an inch of rain (and the roof didn’t cave in), 1/12 of 1000 cubic feet gives us 83-1/3 cubic feet of water. According to my favorite conversion site, that equals 623 gallons! 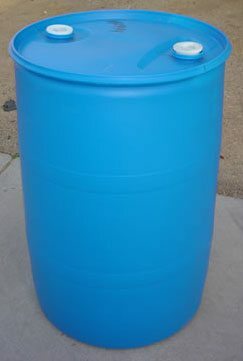 A couple of 55 gallon drums? How about 11 of them! Check out HarvestH2O and this fella who uses pedal power to water his lawn! Inspirational! Patty – good goin’ girl! Show ’em whose got the math down, baby, yeah! Okay, Patty, I stand corrected, what with the Planning Board’s 742 acres. I know that for years, people active in OB have bantered back and forth with the one mile square measurement. Still, I wasn’t that far off from your calculations. Molly, again,you miss the point. The point is a ton of water dropped on our community in 4 hours, enough to supply 124 families with aqua for a year, and none of it was saved. We’ve got to get the waste syndrome out of our heads. Once again readers ought to check out Bran Lancaster’s books on this subject. He was here in San Diego a couple of years ago promoting his ideas & books. Volume I is called Rainwater Harvesting for Drylands. 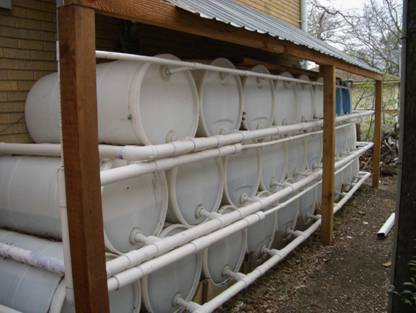 Go to harvestingrainwater.com for a plethora of ideas on how to trap & conserve water. Volume I has a pretty good index at the rear, a glossary of terms, references, an appendix w/ resources listed, and graphs, tables & charts for those thirsty for knowledge. According to the web site, he was on NPR in January & September of 2008. Maybe someone out there can invite him back to help OB collect water. I think he lives in Arizona. Patrick – anyway we could get you to maybe write a review of Lancaster’s book(s)? Sounds like you’re halfway there already. Obviously we all need to collect water. I use the OB experience simply as an example. Did you notice how different our total of .95 inches for Monday 2/16 was from that of the official reading? As the poster, Patrick, noted above, definitely check out Brad Lancaster’s books and website, he is pretty much the US’s leading authority on the subject of rainwater harvesting. Between his http://www.harvestingrainwater.com/ website and http://www.RainTankDepot.com , you should have just about all the info, considerations, and resources you need to make your own rainwater collection devise – from the simple 55 gallon models for garden irrigation to 5000 gallon systems that can feed your entire lawn, wash your car, feed your washer machine and toilet, or just for a source of emergency water during service problems, drought, or water usage restrictions. Good luck!